All WEB24 invoicing is sent out via an email notification with a PDF attachment. After logging into your WEB24 Client Area, you can also view and manage your current and past invoicing. You can print off your invoices, or download a PDF copy. 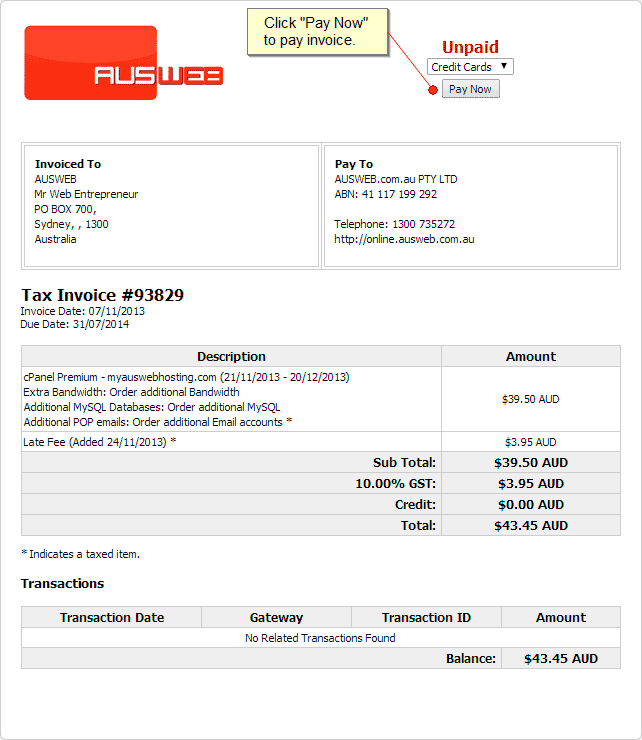 The following tutorial will guide you through paying your WEB24 invoices online, as well as viewing your past invoices. After you have successfully logged in, you will see the Client Area home page. From the top menu bar, click on “My Billing” and select “View Invoices”. Your WEB24 invoice history will be displayed, with invoice number, date, totals, status and a “View Invoice” button. Clicking the “View Invoice” button will display the related invoice. UNPAID invoices will show payment options available (Credit Card or PayPal), with a “Pay Now” button in the top right of the Invoice. PAID invoices will list payment details and status. You can either print the web page displayed, or click “Download” for a PDF copy which you can save or print later. Please note, WEB24 only accepts payments via Credit Card and PayPal. As per WEB24’s Terms and Conditions a late fee applies to accounts which are more than 2 days over due. We recommend you take this into account and do not leave your renewal payment until the last minute.